haha, you got that annoying 1p!! Nice, that's where I go to fill up too. Cheapest I've seen in a while but still criminal. This does my head in..was in Bridgend (wales) at the weekend,and we had 2 pay 119.9...it is not on 1 bit TBH. 17litres to fill up. Mine takes about 60. That would be a good saving, if i were anywhere near. Sainsb dont have petrol where i am. what's the point in a post for a single petrol station for most ppl on HUKD? I have signed up to the email alerts at petrolprices.com/ have added my work and home email into preference section and get told the cheapest station around me! what's the point in a post for a single petrol station for most ppl on … what's the point in a post for a single petrol station for most ppl on HUKD? Been using petrolprices .com for years,really good. I hope that 17.88L isn't the size of a full tank in your car? Mine is more than 3 times that size!! I'm guessing you had a fair bit of fuel already in there or you drive a mini metro?!! Not a bad price for London area, asda was doing it for £1.13 yesterday and i thought that was low !!! Shell in Chiswell Green (St Albans) £1.12. Not a bad price for London area, asda was doing it for £1.13 yesterday … Not a bad price for London area, asda was doing it for £1.13 yesterday and i thought that was low !!! That's exactly what I thought and then I noticed the phone number. 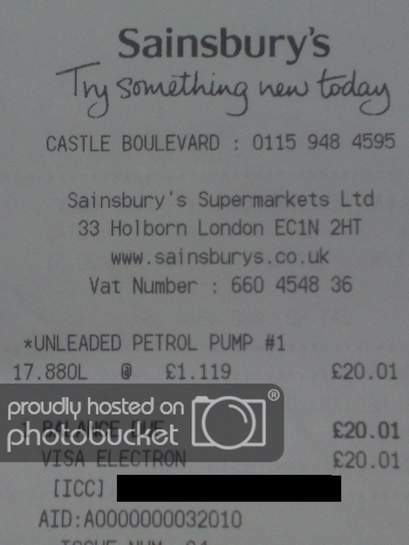 I think the Sainsburys the OP bought his petrol from is in Nottingham. The Holburn address is Head Office. Well lucky you! My Sainsbury's is 117.9haha, you got that annoying 1p!! My local is 115.9 and 117.9! I agree. All these people posting their local petrol pump prices is ridiculous. Why in this country everyone is just saying it's to high but no one doing anything. Every body filling they car and just talking!!!! Why in this country everyone is just saying it's to high but no one doing … Why in this country everyone is just saying it's to high but no one doing anything.Every body filling they car and just talking!!!! why are people bumping old threads? Maybe to show how much it has changed in little over a year? Over here in Rip Off Northern Ireland, it is 1.409 per litre now. You filled up with 17.88 litres? Was it a lawnmower?